12 Noon - 2:15 p.m.
To make meal reservations call:  Charlene Start 802-875-4438, or Flora Anderson 802-875-4131, or email Charlene at countrybear46@hotmail.com. 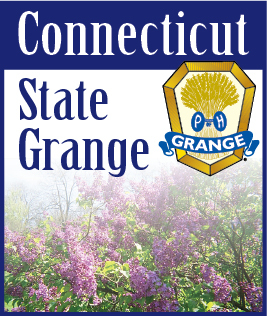 DIRECTIONS: Both the Grange Hall and Meeting House are just off VT Route 103. On I-91 North or South take Exit 6. Turn WEST on Rt 103 toward Rockingham and Rutland. (South bound Exit 6 on I-91), turn LEFT on 103. Go 1 mile, then turn LEFT on Meeting House Road. North bound Exit 6 on I-91, follow signs for Rockingham/Rutland 1.9 miles and turn LEFT on Meeting House Road. Meal reservations call:  Charlene Start 802-875-4438, or Flora Anderson 802-875-4131, or email Charlene at countrybear46@hotmail.com. FROM THE EAST: I-89 OR US4 TO White River Junction, then I-91 South to Exit 6. FROM THE SOUTH: I-91 North to Vermont Exit 6 (Bellows Falls - Rockingham). FROM THE WEST: Vt Rte 103 from Rutland to Bellows Falls. If you have GPS or MapQuest, 116 Upper Bartonsville Road, Chester, VT 05143 will get you there. The Rockingham Meeting House is the oldest public building in Vermont that still exists in a condition close to its original state. The Meeting House was built between 1787 and 1801 to serve the needs of religious services and civic events in the town of Rockingham, whose first focus of settlement had been in the village immediately surrounding it. The town expected to expand rapidly and planned a meeting house large enough to meet its needs. The building stood unused for some decades and suffered vandalism and loss of its contents, but in 1906, after a fire which destroyed many buildings in the village, people of the town and the surrounding area recognized that the Meeting House was a well-preserved historical and architectural treasure and raised funds for its restoration. Much of what stands today is original fabric from the eighteenth century: king-post framing, woodworking details of the exterior, many glass panes in the twenty-over-twenty windows, interior plaster work, and most of the material of the “pig pen” box pews. The pulpit was reconstructed in 1906, but the sounding board above it is original. In size and austerity, the Meeting House is very much a Puritan building of a style already considered old-fashioned in more urban parts of New England when it was built. The Rockingham Meeting House was designated by the Secretary of the Interior as a National Historic Landmark on May 16, 2000. It is owned and maintained by the Town of Rockingham.